Mission: In 2012 the Sam & Adele Golden Foundation for the Arts opened its doors to a one-of a-kind artist residency for artists working in paint. 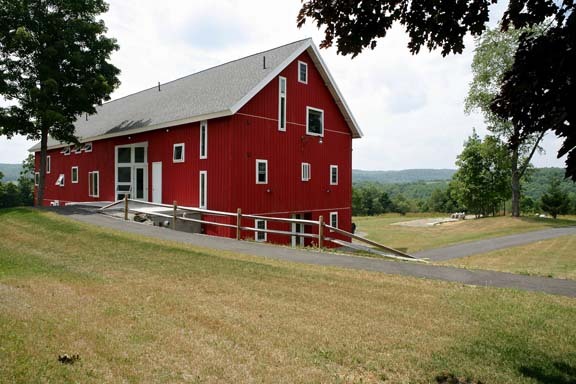 In the beautiful rolling hills of central New York and just several hundred yards from the Golden Artist Colors manufacturing facility, a 19th century barn has been transformed into a 21st century artist residency, with large studio spaces and private residency apartments. Artists-in-residence will participate in a completely unique opportunity to explore the widest, most innovative range of materials and technology available today for professional artists working with paint. Cost: The goal of the Golden Foundation financial assistance is to ensure that all artists who have been selected into the residency program can attend, regardless of their financial status. An artist may receive a partial or fully funded residency from the Golden Foundation. The residency includes all paint materials and technical services. Accommodations: Over 30 years ago as they sat at their kitchen table, Sam and Adele Golden would look out over the picturesque countryside and dream of a community of artists living, working, and creating. Length of Stay: The Golden Foundation will be offering six Exploratory Residency Program sessions. Each session will last four weeks. Benefits: A complete survey of the wide range of acrylic, watercolor and oil paints and mediums, An introduction to custom and experimental acrylic products, An introduction to the Golden Artist Colors laboratories and manufacturing facilities, Opportunities to consult with paint technicians, A supply of acrylic, watercolor and oil paint materials, 24/7 access to open studio space ranging in size from 900 sq. ft. to 1200 sq. ft. (Because of shared open studio space, solvent use will be limited)”, A spacious private apartment with its own private bathroom with shower, Access to a fully-equipped shared kitchen, laundry facilities, wireless Internet access, and spacious common areas, 140 acres of pastoral meadows, woodland trails, and meandering brooks. Posted in Golden Foundation Residency, New YorkTagged acrylic, apartments, application fee, art residency, Artist Residency, artists, artists living, artists working in paint, barn, bathrooms, bedrooms, brook, catwalk bridge, Columbus, community, countryside, creating, custom made paint, dining room, farming, four weeks, gallery space, Golden Artist Colors, golden artist laboratories, Golden Foundation Residency, Golden Paint Residency, Golden Paints, Huth Farm, International, kitchen, large studio spaces, living room, loft studio, materials, mediums, modern, national, new methods, New York, New York City, offices, oil, oil paint technology, oils paints, open floor, paint, painters, Painting, painting studio, private apartment, private residency apartments, range of materials, Rate My Artist Residency, residency, residency fee, rolling hills, rural, Sam and Adele Golden, smaller spaces, space, spaces, Studio, studios spaces, Top 10 Artist Residency, visual artists, walking paths, workingBookmark the permalink. looks like you pay to go live in a Golden Paint advertisement. The Golden Residency actually allows artists who are serious about understanding their use of media to explore options, gain control and experiment with the widest range of materials available for artists. The Golden Foundation is providing the vehicle for this exploration. We do hope that someday all artists selected will be able to attend without any cost. All artists, depending upon their need, do currently receive support from the Foundation to reduce the fees of the Residency. We have worked with artists for over 30 years developing unique materials and inviting them to engage with our technical team and labs. The Residency provides a much longer extension of this unique relationship for a much deeper working knowledge of materials. The only similar Residencies are currently offered by the Kohler Foundation and recently the Corning Foundation. I’d invite anonymous to come and visit and to see the opportunities provided. I don’t think you would be disappointed. Mark Golden, President, Sam and Adele Golden Foundation for the Arts. I attended the residency during the first year and I had the time of my life! The Goldens are fabulous humans and more generous than arts professionals probably should be. The cost listed is the actual cost for them to maintain the residents- however it’s not what you pay- you arrange your own fees. I know for a fact that we had access to all materials- as much as we wanted to try out- for FREE. As someone transitioning from oil to acrylic the ability to use up to $3500 of materials for free was life-changing. I also learned more in my month there than I would have in a decade of fiddling around on my own. And the technicians and education aspect were also priceless. I have never been provided with my own access to a number of on-site technicians in any atmosphere. People who work for Golden in the factory are mostly great and the people who develop new paints are excited to help problem solve. By the way, the Goldens sold their own stock in the paint company to create the foundation. The people who make the paint own the company- so it’s not some corporate giant. I just returned home from a luxurious month at the Golden Residency. I arrived at the residency barn with a small bag of my own Golden paint favorites, not quite believing that we would in fact be provided with as much paint and mediums as our hearts desired. Needless to say that same bag remained untouched. Golden has an extensive line of mediums, varnishes and textures that I became more familiar with by attending incredibly informative workshops with the wonderful tech team at the Golden factory, which is just a quick walk from the residency barn. With unlimited time and resources to experiment I feel like my understanding of acrylic paint has skyrocketed! I can’t wait to see what happens in my studio in the coming weeks. The Golden family is a tremendous force of generosity and kindness and it was a pleasure working with them. I too have recently returned from the month long residency. It was my introduction to acrylics, having painting exclusively with encaustic for several years. The Golden family and technical staff were generous with their time and knowledge above and beyond the standard. This is the place to be to stretch your practice, to test and experiment with the product line in a beautiful and supportive environment. The dedication to producing the best products possible and to providing an exceptional residency experience was demonstrated on a daily basis. The month gave me a working understanding of what some of the various mediums and gels can offer to expand the range of the paint line and how intermixable they are. I give this residency the highest marks for working conditions, studio and living facilities. During my stay each artist was treated with great care and respect. Beautiful place, beautiful setting, great studios, and most importantly wonderful people. A warm, supportive, and very productive experience. Between the bucolic setting, the support from the amazing Golden family as well as those from Golden Artist Colors, I can’t imagine having a more wonderful experience. Nothing was lacking and artists were treated with the utmost respect. Any assistance a resident needed was enthusiastically met. Completely new to acrylics, I learned so much, came up with so many ideas and my mind was blown. If you’re interested in acrylic paint or Williamsburg Oils, DO IT. I had to laugh because a month after my residency, I received an email solicitation from another acrylic company and I thought “Don’t they know I’m a Golden girl!? !” Delete!